I don’t know much about George Wade. He and his wife, Sarah Miller, were my 7th great grandparents. 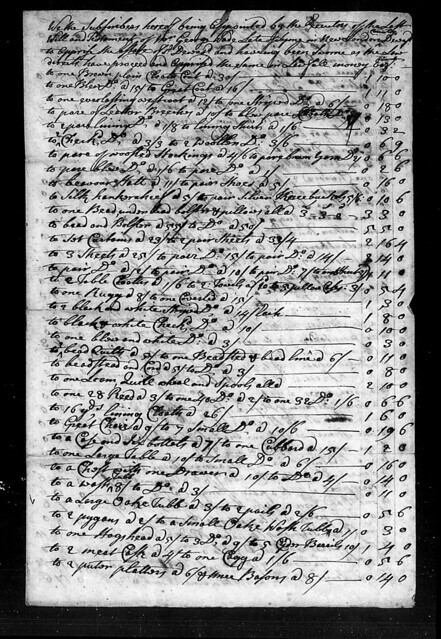 I thought I’d post this, though, because I found his will and inventory and transcribed them. Some of the entries were kind of interesting. The entire probate packet is 36 pages long, so this is actually just a small part of it. First of all, this was back when women did not automatically inherit anything from their husbands, and when they were named in a will, it was only to specify what portion of the real estate they could occupy and for how long, usually along with directions that the widow be given a stipend for living expenses, and maybe if she’s lucky, directions for her to enjoy a portion of the profits from crops or livestock her late husband owned. So George was pretty typical. He also gave his widow a stipend to purchase mourning clothes, which was a nice, if slightly egotistical, touch. What’s great about George’s will, though, is that he not only names his daughters, but also their husbands. So we can see that “my” Sarah Wade, who married Joseph Lord, was in fact the daughter of this particular George Wade. The transcript is below. I should mention, if you aren’t used to reading these things, that there are a few abbreviations that may seem odd. Imprint To my dearly and well beloved wife Sarah Wade I give and devise to her for her own forever the one third part of all my moveable estates whatsoever that shall remain after my debts and funeral expenses are payd as afore said, and also her choice of the best feather bead and furnature including two pare of sheats, one cow,and the horse or mair that I shall leave at my decease, and also three pounds lawful money in order to purchase her mourning apparrell and all the meat and grain that shall be mill at my decease (which sd [said] bead and furnature, cow, horse or mair three pounds money meat and grain) I give to my sd wife over and above her thirds part of the moveable estate which is to come out of the other two thirds of my moveable estate, and also the use and improvement of the one third part of all my real estate so long as she remains my widdow, which I give her for her Right of Dower and power of thirds in my estate. And whereas my two eldest and well beloved sons viz George Wade Junr and Joseph Wade (which sd Joseph is now deceasd) I have some years past given them their portions in full portion of what I shall leave for my other children &c.
Item. to my daughters vizt Hannah the now wife of Samuel Bennet of sd Lyme; Elizabeth Scovel widdow and relict of James Scovel late of sd Lyme deceasd. ; Martha the now wife of Lieut. 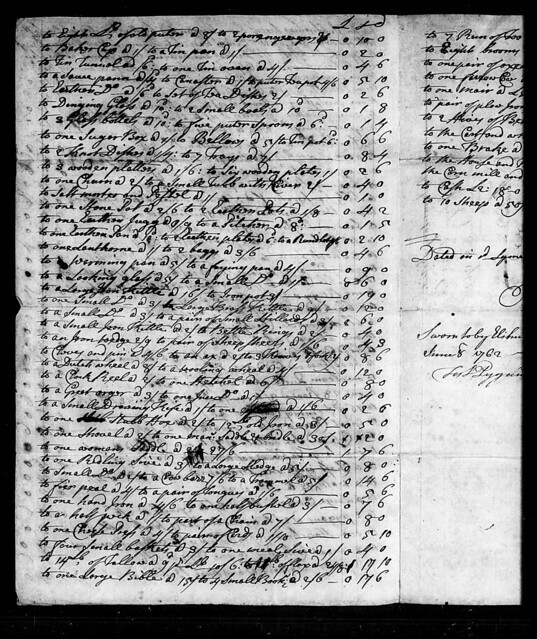 Robert Miller of sd Lyme; Mary the now wife of Jude Luttington of Bradford in the County of New Haven; Sarah the now wife of Joseph Lord of sd Lyme; Asenah the now wife of Samuel Rogers of sd Lyme; and EuniceRoland my grandaughter (which is daughter of my daughter Eunice Roland deceasd) to them I give and devise all the remainder of house hold goods that shall remain after the legacy that is given to my sd wife is taken out to be their own forever to be equally divided between them the afore said Hannah, Elizabeth, Martha, Mara, Sarah, Asenah and Eunice. Item. to my well beloved and dutyfull sons, vizt Elisha Wade and Elihu Wade both of sd Lyme to them their heirs and assigns forever I give and devise all the real estate housing barn corn mill with the stream and [?] belonging to sd mill together with all my lands & meadow and all the remainder of my moveable estate (not before devised) all which is lying & being in sd Lyme which sd land and meadow is bounded and described as of record may appear, which sd estate I give to my sd two sons in proportions as follows, to say my son Elihu shall have twenty pounds more then Elisha in the above sd estate given to them. 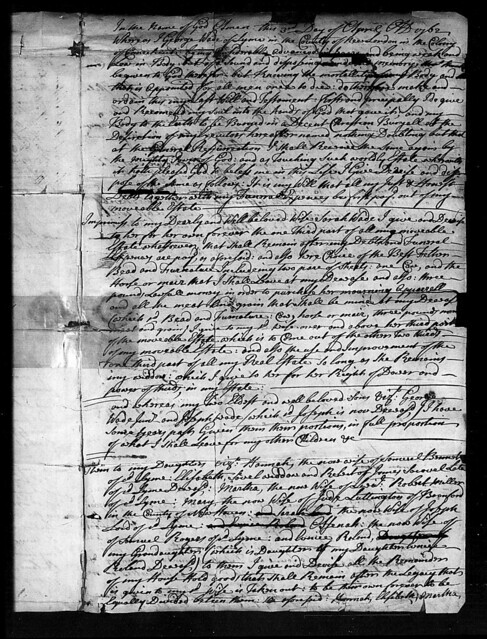 Lastly I do hereby constitute and appoint my afore said two sons Elihu Wade and Elisha Wade to be the executors of this my Last Will and Testament, and do hereby revoke disalow and disannull all and every other former will or wills testament or ststaments; hereby ratifying and confirming this and this only to be my Last Will and Testament. N.B. the words vizt (Lyme; my lands and meadows & all other) were enterlined & made before the executing of sd Will, New London County sd Lyme May 5th A.D. 1762. Then & there presonally appeard Mr. John Lay 2nd Esqr and made oath that he saw & heard Mr. George Wade deceasd sign, seal, publish Pronounce & declare the above & within written Will to be his last will and testament and that he together with John Lay 3rd & Peter Lay signd the same as witnesses in the presence of the testator & of one another ant that he is of oppinion that said Wade was at that time of sound mind & memory. 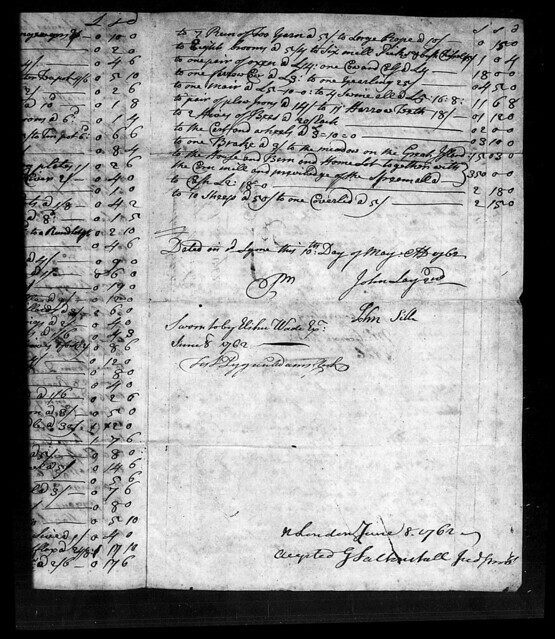 New London County sd Lyme May the 7th 1762. Approved G Saltoustall Jud & Probt. We the subscribers hereof being appointed by the executors of the Last Will and Testament of Mr. George Wade late of Lyme in New London County deceasd to apprise the estate of sd deceasd and haveing been sworn as the law directs have proceeded and apprised the same in lawfull money vizt. 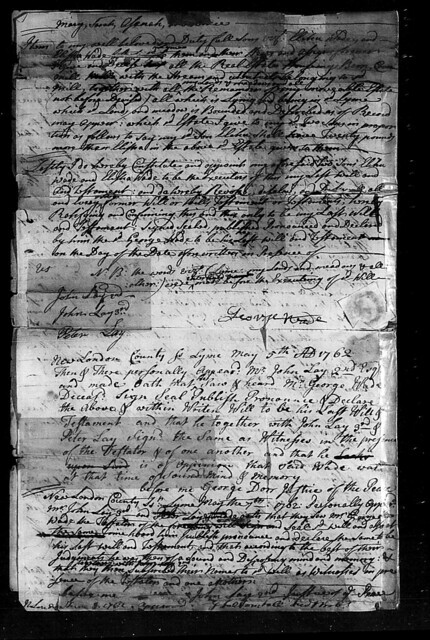 Dated in sd Lyme this 10th day of May A.D. 1762.
sworn to by Elihu Wade Exr. Accepted G. Saltoustall Jude. Probt.